DASH (Digital Cash) was one of the first altcoins to be fully promoted as a payment solution in the blockchain era. In Bitcoin’s seminal whitepaper it is described as a “peer-to-peer electronic cash system”. With Bitcoin’s rising fees, long transaction times and lack of anonymity critics of Bitcoin have been eager to point out its shortcoming in this space. In response, DASH came to the cryptosphere with a strong vision for cryptocurrency as a payment service. The cryptocurrency introduced the concept of masternodes. Aiming to be used as a form of transfer, the blockchain is built on a network of dedicated computers that act as infrastructure to process transactions in real-time. As soon as a transaction happens the masternodes lock specific tokens even before the blockchain has fully validated the transaction. This means that transactions are quick and users cannot spend the same tokens twice. DASH has decentralized governance which means masternodes can vote for or against new developments to the DASH network. It also has private transactions called PrivateSend which allows users to send funds anonymously. Lastly, InstantSend allows users to transfer funds that confirm in almost real time. Not all wallets have the full set of DASH features available. In this guide we will be taking a look at the best wallets for safely storing your Dash coins – we have broken it down into Hardware, Software, Mobile and Paper wallets so you can quickly choose the best option for you. The two most popular Hardware wallets are the Ledger Nano and the Trezor, both support Dash and we have compared these two wallets further in our complete review. This device supports Windows, OSX and Linux. It requires the Google Chrome browser and plugs in via a USB port on the computer. Unfortunately this wallet does not have mobile apps for Android and iOS. The device comes with its own software called Ledger Manager that allows you to install the portions of the software that you need. It is also a multi-currency wallet so you can store your other cryptocurrency, such as Bitcoin on it as well. This wallet is an HD (Hierarchical Deterministic) wallet. This simply means that it generates a new address for each transaction ensuring your privacy. Your old wallet addresses remain valid should you still wish to use them. If you need to know more about the Ledger Nano, take a look at our in-depth review located here. The Trezor Wallet is also a multi-currency device that supports DASH. Trezor prides itself in being the original Bitcoin hardware wallet on the market and has since expanded to support many other currencies as well. It is primarily a desktop device but also has support for Android mobile devices. As with the Ledger hardware wallet it also uses a Chrome extension to interface with the device. KeepKey markets itself as being a simple cryptocurrency wallet. The design and features are very minimalist. Similar to the Trezor wallet it also supports Windows, OSX, Linux and Android through a Google Chrome extension in the web browser. Since Google Chrome is a cross-platform browser and the most used web browser on the market it makes sense to release an extension for the browser. Currently these hardware devices do not allow you to use the InstantSend and PrivateSend features of DASH but the developers plan to add these features in future. The Jaxx Wallet was originally created in 2014 by Ethereum co-founder Anthony Diiorio. The wallet supports a multitude of platforms including Windows, OSX, Linux, iOS and Android and even has a Google Chrome browser extension. The best security advantage is that Jaxx puts you in control of your own private keys which is stored on your device. Jaxx does not have the InstantSend and PrivateSend DASH features built-in. A handy feature is that the Jaxx wallet also gives you the ability to export your private keys if you wanted to. This is handy when a coin forks or splits into different branches such as the recent split between Bitcoin (BTC) and Bitcoin Cash (BCH). This allows you to generate another wallet with the same private keys and to gain access to your funds of the new cryptocurrency. The Jaxx wallet also has ShapeShift.io integration which means you can convert your cryptocurrencies inside the wallet. The Jaxx wallet is also an HD wallet and will generate a new wallet address for each transaction. This wallet aims to minimize the barrier to entry when it comes to using cutting-edge digital assets. The software is designed to be very user-friendly. As all good desktop wallets it supports Windows, OSX and Linux. It also supports a whole host of other cryptocurrencies and altcoins. Like Jaxx, Exodus does not have the InstantSend and PrivateSend DASH features built-in. Like Jaxx, Exodus also has the ShapeShift.io service integrated. Similar to Jaxx, the Exodus wallet is also an HD wallet. 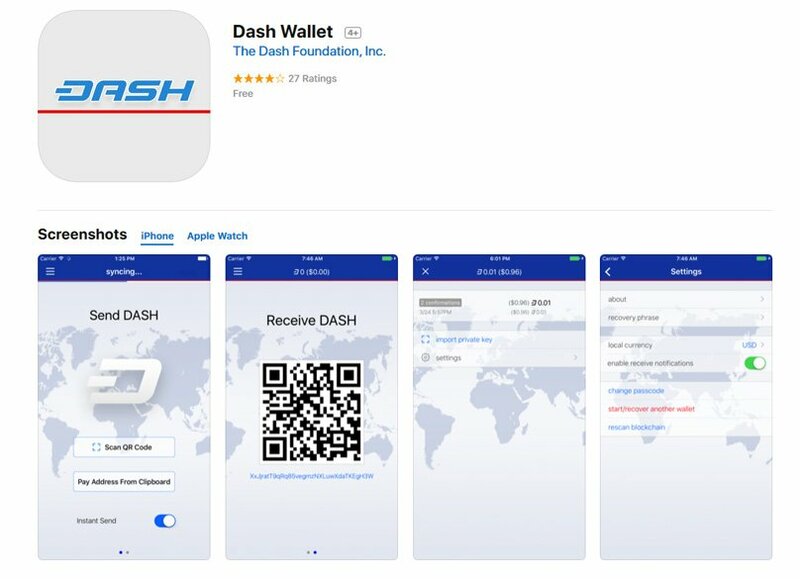 This is the official DASH wallet. It is known as a professional or heavy wallet which means it is very large in size. It installs a full DASH node on your computer. DASH Core has all the features of DASH including InstantSend and PrivateSend enabled. Coinomi is a multi-currency mobile wallet with support for Android as well as a beta version on iOS. Your private keys are stored on your device. This wallet used to be open source until a malicious clone of the wallet appeared online, misleading some users into using it. The project now has closed source code with a newer version of their wallet released. This is an open-source mobile wallet. You are in full control of your private keys. An interesting feature of this wallet is that it allows you to do offline transactions using Bluetooth. Also great for a mobile wallet, the DASH Wallet has the InstantSend feature of DASH but does not have the PrivateSend feature enabled. This wallet is only available for Android devices on the Google Play Store. The DASH wallet is also an HD wallet ensuring your privacy with each transaction. Luckily for iOS users there is also a great mobile wallet available just for Apple users. It connects directly to the DASH blockchain and you can recover your DASH coins if your phone or tablet is ever lost or damaged. As it is also built on the DASH Core this wallet has the InstantSend feature of DASH, but it does not have the PrivateSend feature. The DASH Core iOS wallet also has ShapeShift.io integration so you can easily convert your coins from once cryptocurrency to another from within the wallet. If you are on a tight budget and cannot afford a hardware wallet but you are also concerned about security, the next best option is a paper wallet. Even a mobile wallet haas some form of risk as the private keys are still stored on your device. The DASH Paper Wallet does not have any of the extended DASH features including InstantSend or PrivateSend. Hardware wallets are a great investment if you are worried about security ( and you should be! ). They do not run a common operating system so the devices are immune to computer viruses and exploits that could steal your private keys and will protect your keys in the event that your computer is compromised. It is good to always check whether the wallet app that you use stores the private keys on the device itself. A lot of scam wallets out there store private keys online and the developers have full access to wallets and funds. All of the wallets on this list are endorsed by the official DASH website so safe to say that they are reliable and have a good reputation. Web developer, blockchain builder and blog poet. Don’t forget Edge wallet for mobile and Electrum for desktop, both excellent tools! Thanks Leon, those look like great products! What about Guarda wallet? They doing multicurrency wallet.